This minimalist, painterly still life, with its restricted colour range and fluid technique, is painted with superb confidence and an eye for placing the few strong notes of orange and yellow. The succulent blacks and whites dividing the picture field derive from 19th century masters such as Fantin-Latour and Manet; and it is clear that Flanagan either trained as an artist or had practised for a long period as an amateur to achieve such a bold style. 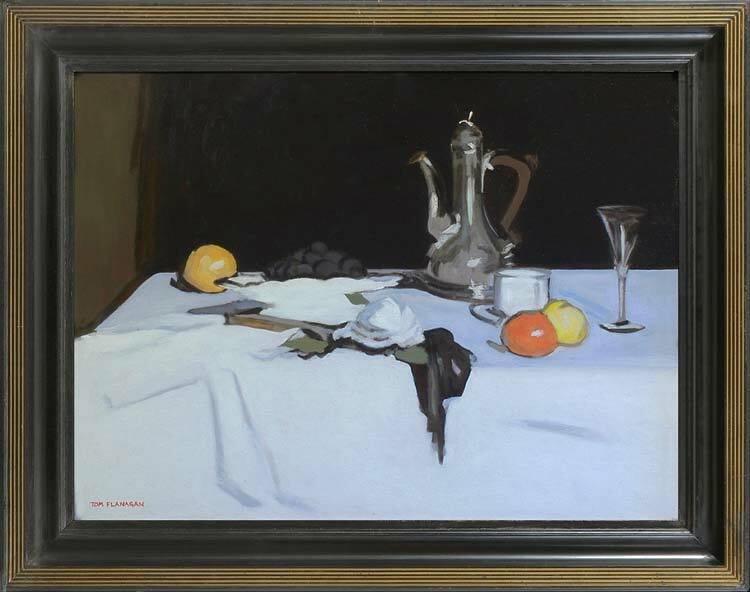 Other still life paintings by him, such as Still life with roses, or figure paintings, such as The black hat, indicate a bond with or knowledge of the Scottish colourists. The latter is reminiscent – with its behatted model posed in front of a looking-glass – of the work of F.C.B. Cadell, and the former of flowerpieces by Samuel Peploe. It is possible that Flanagan may have studied under one or other of this group. Very little is known about Tom Flanagan (20th Century), although works by him occasionally surface in provincial salerooms. He cannot be synonymous with the young video artist active in the Enso group c. 2005, nor with the older Canadian artist of the same name. He may have been a trained or self-taught amateur artist, who earned his living in some other profession but continued to produce highly competent landscapes, still life paintings and figures in his characteristic graphic and painterly style. He always seems to sign his work in the bottom left-hand corner, in red capital letters.